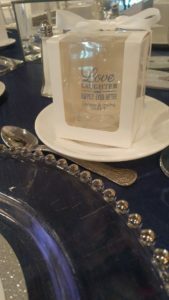 Today’s post covers one of the items many brides are checking off their lists as wedding season approaches: favors for your guests. 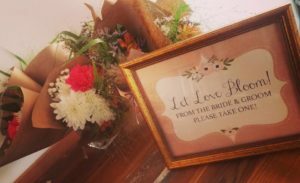 Of course your guests will be wowed by the level of detail you’ve put into your special day, but don’t forget that they want to take a piece of that day home as a token of remembering just how magical it was. 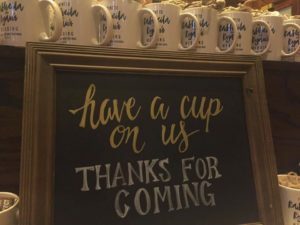 Favors are your opportunity to express how grateful you are to each of your guests for their attendance at your marriage celebration — and a great way to showcase something near and dear to you and your new spouse! 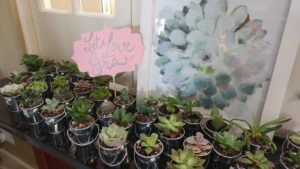 I’ve recapped a few of my favorite favors and some I’m dying for someone to try! Everyone loves a snack, so this is a great way for your guests to take the gourmet celebration on the road! 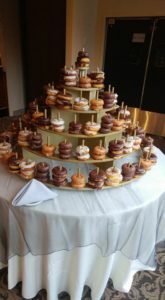 A few of my favorites have included mini donuts, candy tables to make your own goodie bag, and jerky made by the groom! 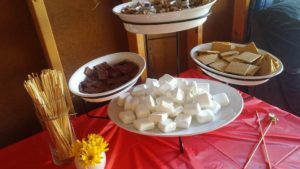 S’mores are always a crowd pleaser! 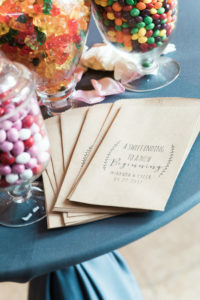 Candy buffets with treat bags will leave guests with something sweet to take home! 2. Custom mugs — also related to food! 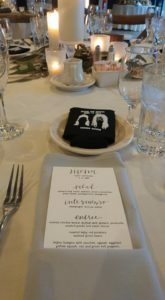 For my own wedding, we ordered custom mugs complete with adorable ceramic spoons despite not being coffee lovers. 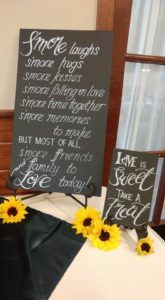 One of our favorite dates includes ice cream treats and trying out local spots, so we incorporated that into our wedding day with a custom ice cream bar complete with tons of delicious toppings. Guests enjoyed the ice cream bar then took home the mug to continue their own coffee or ice cream treat tradition! Stemless wine glasses are another popular choice! 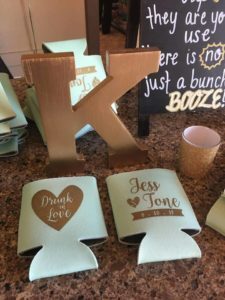 There’s something to be said about incorporating something that is unique to your day, whether that means branding a koozie to be distributed at the bar for your favorite cold ones or even sending your guests packing with the hangover cure kit (a shot of whiskey), a little trinket that suggests the party can continue elsewhere is always a bit hit. Drunk in love? Grab a Koozie! 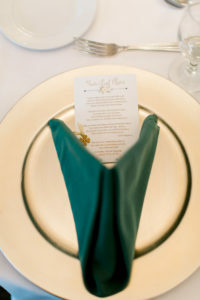 I love a note on menu cards or a special sign on tables about donations to organizations that are close to the couple’s hearts. 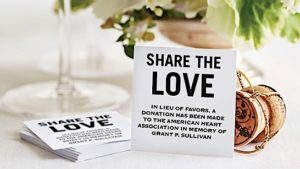 Some of these donations are to organizations where the bride or groom works (think St. Jude Children’s Research Hospital), an organization that supported the family in some significant way (think Alzheimer’s Association), or even a special fund for an individual close to the couple. You simply cannot go wrong using your funds for good as your first gesture as a married couple! A little luck for a good cause! This idea is way too cute! 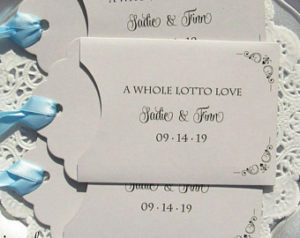 Scouring Pinterest, there are tons of custom envelopes with phrasing like “for richer or poorer,” “lucky in love,” or even “X and X have won the lotto marrying each other!” In any case, giving your guests a little bit of an activity to do while waiting for dinner is a nice gesture and the extra few bucks you might walk away with could be well worth the creative time spent. 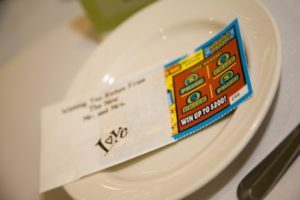 Vegas themed tickets tied in a bow! I know, it’s not “6 on Friday” but these were too good not to share. 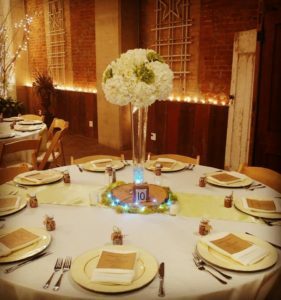 Mini bouquets or potted plants are a great way to inspire your guests’ inner green thumb! Mini bouquets wrapped in parchment are the perfect boho favor!